Philosophizing The Walking Dead S2E3 Save Last One and Do Zombies Believe In God? Welcome to our journey into the guts of The Walking Dead. What kind of journey? A philosophical, psychoanalytical and political kind. What I would like to do over the next couple months is dig thought the Walking Dead episode by episode to see what it can teach us. Thank you for following me on this journey. I look forward to reading your comments. Be forewarned: There are spoilers everywhere. Don’t forget to check out my previous article in the Philosophizing TWD series: Philosophizing The Walking Dead S2E2 Bloodletting or is Rick Menstruating? For the amount of tragedy and death involved in The Walking Dead there is surprisingly few religious references. Most of the God references that come from characters who have explicitly stated an ambiguous relationship towards God. In Blood Letting Rick belts out a prayer in an empty church while Shane and Carl wait outside. In the prayer, he seeks a sign in order to silence the dialog in his own head. The battle ground of his self-esteem. He can't make up his mind if he has the kind of fidelity a leader needs towards his own actions. 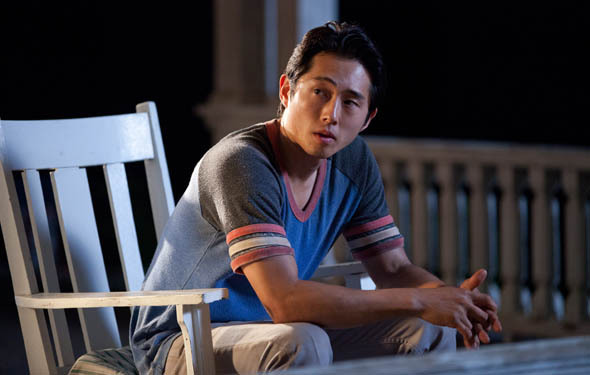 Glenn: Why do you sneak up on people so much? Maggie: You are easy to sneak up on. Glenn: I was Praying. I was trying to. Maggie: You religious? You Pray a lot? Maggie: Wow. Sorry. I didn't mean to ruin your first time. Glenn: God probably got the gist. Glenn: Friends. Looks like they could all use a little help right now... Do you think God Exists? Maggie: I always took it on faith. Lately I've wondered. Everything that's happened there must have been a lot of prayin' going on. Seems quiet a few went unanswered. Glenn: Thanks. This is really helping. Maggie: Sorry. Go ahead really. Glenn: are you going to watch? What does it mean to take the existence of God on faith? This is a complicated question. Existence is a property a thing has in the world such that a relationship is formed with it through language which gives it meaning as a being. Something has being when it can be thrown into language, and is something which is in the world. If a thing is in the world, and can have words attached to it such that it can be communicated then we are talking about a being which exists. God, in so far as we are talking about the general purpose Christian God, which the Walking Dead implies can be put into language but does not have existence proper. God is not in space and time with other beings. In order for God to exist in a state that is more than the words used to communicate an idea, God would need to have presence in space and time where it could be in direct, measurable and perceptual relationship with a set of individuals who could throw the entity into language. In order for God to exist, it would need a minimal level of presence in space and time. In other words, it would need to exist simultaneously and in the same spatial realm along other entities who have verified their existence to each other. So, what does it mean that Maggie takes the existence of a God on faith? Faith is a relationship towards a statement rooted in conviction, trust, confidence or an enmeshed interplay of these concepts. For example, trust is an individual’s relationship towards a statement rooted in a fidelity towards the integrity of a claim. Maggie takes God's existence on faith by trusting in the integrity of a claim that God exists. Maggie, is also a woman in a white male patriarchal family responding to the role allocated to her years of being her father's God fearing child. Trust, in this case would be the interplay of Maggie's sociopolitical position in her family, the religious culture of her family, the southern religious community which she grew up in, her education, and the level of subjectivization these environments play in foreclosing and promoting a routine of belief. In other words, Maggie's immediate family, and social environment has role in training her capacity to develop faith, and distinguish between claims that require faith and those that do not. One may argue that set of social relationships that Maggie was born into and grew up enduring do not totalize all that goes into what faith is for her. Maggie has autonomy to make clear decisions about what she is feels deserves faith and what does not. How is this freedom structured for her? Did she choose the choices that she is choosing among? What was encouraged by her family first; The drive towards the freedom to be autonomous and developing the power to critically engage with choice of faith, or was she obligated into a relationship with a church attendance every Sunday? And even if she made a free choice as a toddler, and again as a teenager, and again as an adult, was she given the cognitive tools in order to interrogate statements for integrity, and worthiness of faith? Can faith, even describe existence? If I am sharing space and time with a chair I can interrogate its properties. A chair usually has four legs and is sturdy enough to sit on. It can hold a person's weight, and it is designed in such a way where sitting is a reasonable expectation. I can also inspect the chair to see if it is wobbly, and what properties each of its parts are constructed from. Based upon my understanding of each of a chairs properties I can say that I have faith that if I sit on this chair it will not collapse. There is a couple variables here. I could be a man weighing over 300 pounds, and the chair is kids chair made from plastic. If I had level of faith in this plastic to hold my existence on top of it without collapsing, I would be wrong. And if you interrogated my reasoning for the assumed properties of a chair then you would find a slew of fallacious core beliefs about reality that support faith without integrity; AKA bad-faith. What if the chair was not located in the same space and time that I was? Could I look out into the room and say, there is a chair it has X, Y, and Z properties and I could probably sit on it. Sure I could say that, but if I had faith in the chair's existence I would be in bad faith in relation to my temporal and spatial reality. The same applies to God. Maggie, who has been ruthlessly acculturated, to be in bad faith in relationship to the existence of God is making the claim that she trust the integrity of the statement that 'God Exists' even though the entities internal to the statement do not specially and temporary coincide with her being. There are one of two potentialities that I see here, either Maggie is using a separate definition of being for her personal experience of being, or she, is experiencing psychosis and her perception of the world is not in accord with her existence in it. Does it Matter if God exists? As far as Maggie is concerned whether God exists is irrelevant. Her argument is rooted in the idea that events intervene into our social and personal narratives that are difficult, and it's not God's role to support our understanding of them, but for us to create our own narrative. So, while Maggie claims she is a theist, she behaves as if she is a Nietzsche-ian. There is no truth in the world, God does not directly intervene in the world, terrible experiences happen and they are senseless, and we suffer them. We can either encode a traumatic experience with a meaning that fits into our current narrative, or we can create a new narrative to recreate who we are in respect to the trauma that impacts us. God doesn't dirty its hands in our existential struggles, or how we create meaning out of the meaning resistant experiences we have in our lives. So, if God exists or if God does not exist, it doesn't matter, because at the end of the world where all is suffering and survival it is only though our personal and social struggle towards meanings that our lives become relevant. Q.E.D. I'll leave you with a quote.